An annual award &ldquo;to the defense player who demonstrates throughout the season the greatest all-round ability in the position.&rdquo; Winner selected in a poll by the Professional Hockey Writers&rsquo; Association at the end of the regular schedule. History: The James Norris Memorial Trophy was presented in 1953 by the four children of the late James Norris in memory of the former owner-president of the Detroit Red Wings. Drew Doughty of the Los Angeles Kings won the James Norris Memorial Trophy for the first time in his career. He is the second Los Angeles player to win best defenseman honors, joining current Kings front-office executive Rob Blake, who won it in 1998. Doughty was named on 147 of 150 ballots, including 93 first-place votes and 37 second-place selections, for 1,254 points. Erik Karlsson, who won the Norris for the second time last season, finished in second place this year with 46 first-place votes and 1,020 points. Brent Burns of San Jose had three first-place votes, 26 seconds and 54 thirds for 619 points, finishing third ahead of Kris Letang of Pittsburgh who had eight first-place votes but 587 points overall. Roman Josi of Nashville had 120 points to finish fifth in balloting. Doughty appeared in all 82 games for the second consecutive season and was third in the NHL in average ice time (28:01), helping the Kings to a third consecutive top-five finish in team defense (third, 2.34 goals against per game). He registered his highest goals (14) and points (51) totals since 2009-10, posted a career-best +24 rating and topped the NHL in several enhanced statistics categories, including the team puck possession metric SAT (shot attempts differential). The Kings recorded 537 more shot attempts than they allowed with him on the ice at 5-on-5. 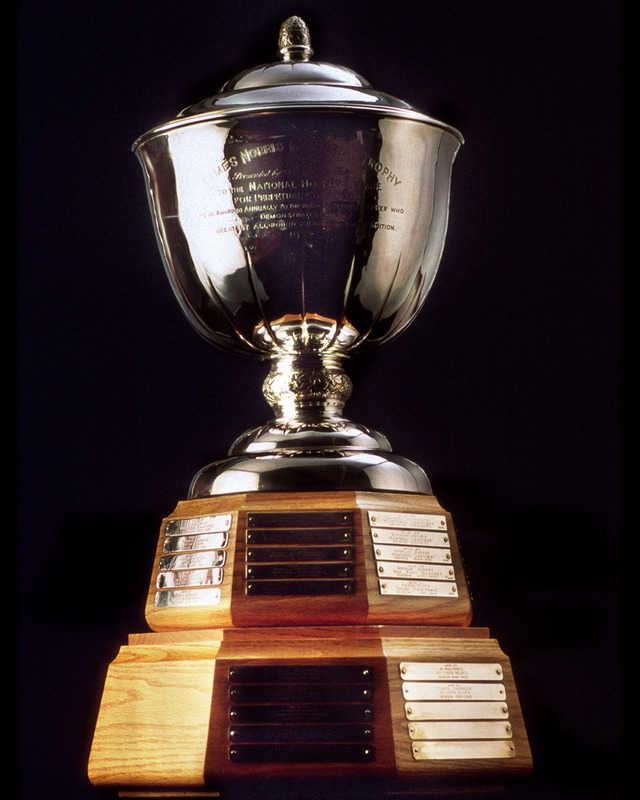 The James Norris Memorial Trophy was presented in 1953 by the four children of the late James Norris in memory of the former owner-president of the Detroit Red Wings.